IAPCO would like to recognise the innovative and pioneering work of our four Founding Fathers. To celebrate the tremendous efforts of these individuals, we have created an award to commend the most creative and high achieving young member of staff of an IAPCO member company. Amber Chen, Assistant Vice President, GIS Group Taiwan was announced as the winner of the 2017 IAPCO Driving Excellence Innovation Award at the spectacular IMEX Gala Evening. The results were close and both runners-up deserve recognition for their innovative concepts around meeting design: Rosa Garriga Mora, Kenes Group and Christina Gotze, Congrex Switzerland. • Entries are limited to one staff member per Member, but any staff member, whether from a Company Member or a registered member office, is eligible. OR the implementation, organisation or marketing models underpinning this solution. the potential to create impact nationally or international by putting the spotlight on creating a legacy from the positive outcomes of a congress. the quality of service delivered to the client beyond the call of duty; support and level of service that assisted the client in superseding the objectives of the congress and/or the organisation. the likeliness that ideas/innovations can be sustained and have significant, long-lasting and increasing impact and as their capacity to be inspirational for others. Using the online form located within the IAPCO Member Dashboard. The nomination should include a 500-word statement outlining the candidates innovation referring to the criteria set out above, contain up to 3 graphics or images and should include a 50 word biographical detail of the candidate. Up to a maximum of 3 candidates will be shortlisted from the submissions by Council and the Company Member who made the nomination will be notified no later than 31 December. The final submission, by way of a 3-minute video from the candidate themselves, will be shown at the General Assembly in February, voted on by the members present. The winner will be announced at the IMEX Frankfurt Gala Evening and will receive by way of recognition one free registration place, including accommodation, at one of any of the IAPCO education programmes (valid for an 18 month period), and will be entitled to display the Award Mark on their business cards, stationery, biographical details and cv. 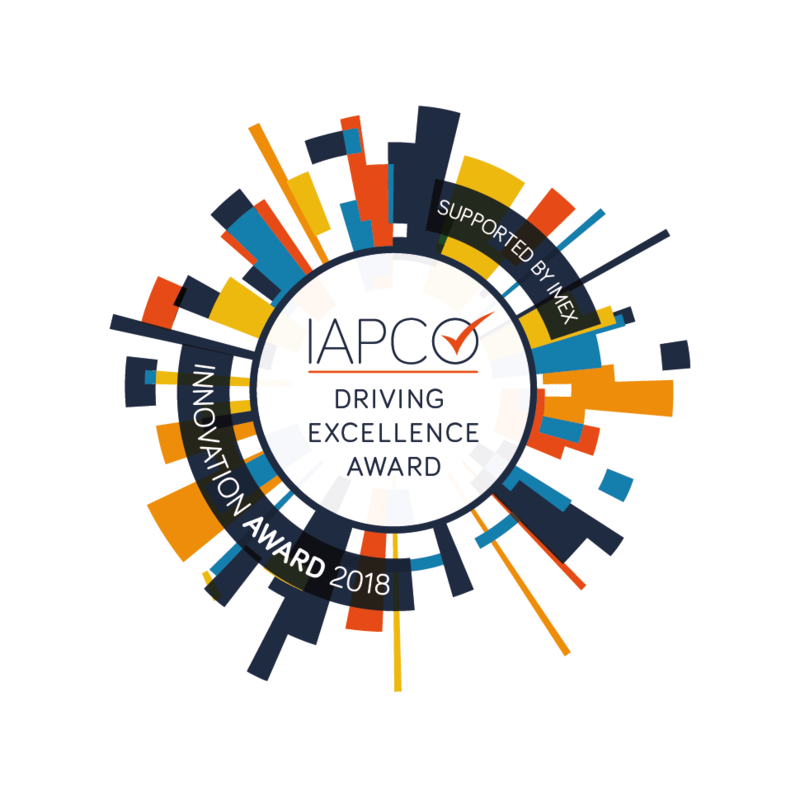 Elizabeth Winter of African Agenda was the celebrated winner of the IAPCO Driving Excellence Innovation Award 2016, as announced at the impressive IMEX Gala Evening in Frankfurt. Corne Koch of Wesgro Convention Bureau was delighted to accept the award on Elizabeth’s behalf, presented by Jan Tonkin, IAPCO President. Elizabeth’s award winning innovation was a “standing discussion”, a session, which took participants out of their comfort zones and brought them together to share ideas in a lively, structured discussion. Experiences and knowledge were shared and new ideas sparked, as all corners of the session topic were explored. The bonus connection of improved cognition and physical movement to strengthen learning, improve memory retrieval, and enhance motivation and morale was not missed by the participants who scored the sessions highly when surveyed post conference. Jan Tonkin, President of IAPCO, was delighted to present the 2015 Innovation Award to Yoshihito Takahashi from Congress Corporation, Japan at the IMEX Gala evening. Yoshihito’s innovation was an app, which streamlined the process of participant attendance for lunch seminars. This ensured that there were none of the dreaded queues and delegates could check availability for the seminars in real time, all with the added bonus of being completely paperless. “Thank you very much for this prestigious award. I am very happy that my innovation was evaluated in this way by IAPCO, that sets the standards for our industry,” said Yoshihito Takahashi, Congress IT Director of Congress Corporation, Tokyo, Japan, “This is a great honor and will stimulate me to strive even harder to come up with more beneficial technology for our industry that is constantly evolving, into the future”. Andrew Dergousoff, of ICS Canada, was announced as the winner of the inaugural IAPCO Innovation Award at the IMEX Gala Evening at Frankfurt Opera House in May. The new award for PCOs attracted numerous applications, and the three short-listed nominees were presented by Council to the audience at IAPCO’s Annual Meeting in Lisbon, for delegates to vote on the nominees’ innovative ideas, implementation, and successful contributions to their companies.